There has been a huge amount of interest in Canon J John’s recent guest post on the dangers of Halloween. I am very much in agreement with J John that Halloween is not benign. Even though it is becoming increasingly secular, there is little if any value in it other than being an excuse for manufacturers and retailers to push an unending range of cheap insipid products on the public in order to boost their sales figures in the run up to Christmas. Given the different elements and beliefs Halloween encompasses, Christians will inevitably have a range of views on how best to approach it. In the interests of furthering the conversation, I am therefore publishing a piece I was sent in response to J John’s post by Richard Magrath that looks at Halloween from a slightly different angle. Richard is an Anglican and works as a legal researcher and his article provides plenty of food for thought. He is on Twitter at @Richard Magrath. I have always enjoyed Halloween, and so when I read Canon John’s post ‘Halloween: harmless or harmful?’ I felt I should speak a word in its defence. The differences between the ‘traditional’ and modern Halloween are clear. The main one is that people do not believe in supernatural things in quite the same way as they once did. In the New Testament there is a tension  between the idea of the devil “as a roaring lion, walk[ing] about, seeking whom he may devour”, and as a strong man who is nevertheless bound by burglars who then proceed to steal all his goods. In the latter category one might also place the failed Tempter in the wilderness, whose offers of satisfying physical hunger, the chance to prove one’s own importance, or a power or sorts over the kingdoms of the world, all prove to be resistible. I think it is fair to say that non-Christians do not believe in the former sort of devil anymore. Imagine a hen party wearing flashing devil horns, or a man in a cheap ASDA devil costume. They are not really throwing their lot in with the forces of villainy. If Dennis Wheatley’s diabolical Canon Damian Mocata were to invite them to one of his satanic dinner parties, I suspect they might, at the most, go along for the first fifteen minutes, out of interest; but they would certainly leave before the first goat was brought out. In reality, drinking and everyday decadence would probably be the worst of what modern ‘devils’ get up to. This imagery and its connotations would simply be quite meaningless to them. And, in their defence, I doubt there are many Christians who posit that the devil actually has a pitchfork and cloven hooves. A man wearing an eyepatch and a tri-corner hat is not making a statement about his feelings on the ethics of real modern piracy (although one can imagine a ‘Comment is Free’ piece on that subject, admittedly). Vandalism and public disorder is always to be lamented, on Halloween and elsewhere. But, historically, the calendar has always had its ‘mischief nights’ where people felt an irresistible urge to run wild. (Perhaps the modern Saturday night qualifies as a regular example.) And, historically, these were often tamed by Victorian era reformers; who (when they did not ban them outright) made the festivities formal and respectable, getting the Sunday school involved and substituting harmless folksy activities for drunken rioting. Perhaps this might be compared to the modern, tamed, commercialised and Americanised festival of Halloween – which would be praise for the latter. Throwing eggs and toilet paper at houses (which seem to be the worst trespasses of American-style Halloween) seem innocuous compared to traditional home-grown British activities such as goose-riding, sparrow-mumbling, pelting clergymen with rotten apples etc. 3. Fairies, unicorns, and other harmless creatures of the imagination. I am sure few people have problems with the exercise of the imagination in itself. Indeed, it might be considered an actively positive thing, and therefore an additional point in Halloween’s favour. The reader might ask: but what about those horrors that are not imaginary, but all-too-plausible and real? And what about those stories without a conquering hero or a happy ending? Admittedly, of course, at this point we are not really discussing things aimed at children. Why do people read and watch these sort of stories? Because they are tragedies; and just as with Greek tragedies, one might watch them to feel pity and fear, and in doing so purge oneself of pre-existing feelings of pity and fear. Why are horror films tragedies? To discuss what tragedy is is to embark on an enormous question; but, in part, tragedy is about suffering inordinately for something that wasn’t entirely one’s own fault. “The hero’s downfall, therefore, is not a result solely of his action but is also a suffering” . Antigone disobeyed the ruler of Thebes; but one understands her motivation for burying her brother. Oedipus killed his father; but he was returning a blow to an unknown man who struck at him from a carriage. The victim in a horror film probably should not have wandered outside alone at midnight to see what that strange noise was; but might we not have done the same, perhaps? It is the same with the famous observation about how virgins in slasher movies always survive and promiscuous characters always die. This was surely never intended as a crude moral point; nor was it ever taken by the audience as a lurid warning of real-world dangers (as it might have been if it was in a soap opera); rather, it is a vague intimation of morality: “it does not cross his mind to think about [sin and guilt], and yet if the reason for the suffering is hidden from him, there is a dark presentiment of the reason in [his] sorrow” . There are currently big queues at the National Gallery to see ‘Saints Alive’, Michael Landry’s exhibition based on the lives and images of the saints. I have often thought it would be nice to celebrate All Saints Day with fancy dress, as one does Halloween, except based on the lives of the saints; certainly there would be copious material. My section on tragedy, above, was partly borrowed from Kierkegaard, who had a famous distinction between the ‘aesthetic’ and the ‘ethical’: the directionless, uncommitted lives of youth, with a focus on the immediate and the external; and, against that, a life of commitment, accountability and self-awareness. The question is how one can move from the former to the latter. Perhaps in a way, Halloween could stand for the aesthetic, with all its excitement and its immediate pleasures, its hedonistic pursuits, its meaningless playing with symbols (including, like the devils above, those clearly stripped of any ethical content), the gather-your-rosebuds-while-ye-may transitory joy of all secular(ish) celebrations. All Saints on the other hand is the ethical: the celebration (and emulation) of men and women who devoted their lives to Christ, and who were no less interesting and exciting for all this, leaving courageous and inspiring life histories behind them. For Christians, Halloween is, of course, All Hallow’s Eve: necessarily connected to its following feast day – and surely an eve is never greater than the feast it precedes. It is often noted that seriousness and silliness go together. In the middle ages they had their carnivals tied to the Church’s calendar; nowadays we eat mince pies, drink wine and relax after Midnight Mass. Perhaps Halloween and All Saints are like that, but the other way around, with the frivolity first. But, as I have explored above, it is more than just merriment. Rowan Williams once said that reading Ian McEwan’s novels gave him a brief insight into what the world looks like from the perspective of a non-believer. Perhaps Halloween, with its silly, fleeting pleasures and its appealing melancholy could form for us the dark backdrop against which shine the saints, wearing robes of white, reflecting the glory of God. I think one of the dangers within the church is that we respond as party poopers. We seem to complain about dangers and give the alternative of doing nothing and being miserable. Perhaps part of the reason people are looking for supernatural engagement outside the church is because the church had forgotten to its roots. Do people see the church as spiritual or as was said in yes minister for the CofE God is an optional extra. 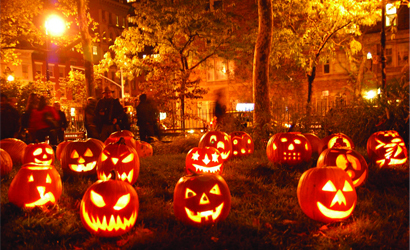 Perhaps banning Halloween reveals the church’s discomfort with the spiritual of fear of evil. There is a real danger in evil something I will blog about next week. But we have a real oppertunity at Halloween to show that Christ has won the victory over evil. So like Patrick and the Celtic Saint of old we need to use this oppertunity to show the true joy of the faith. We take the opportunity to have a light party at our church and invite friends with children to win their sweets by completing games and having fun. This article is an interesting partner to j john’s earlier piece. I agree with some of your points in that we cannot live life in denial of the reality of darkness, but I do think that there is a difference between indulging it and addressing it from a standpoint of victory. We are constantly encouraged to think about what we feed our bodies with, and how we nourish our children in order to enable them to flourish physically. But there seems to be less emphasis on what we feed our minds, or those of our children with. There are increasing signs that what we dwell on has an impact on our outlook and our lives, for example cases cited of violent assault that are preceded by Internet access to footage of similar crimes, and recent research indicating that ‘letting your anger out’ increases our levels of anger rather than dissipating it. As Paul advises us: ‘… whatever is true, whatever is noble, whatever is right, whatever is pure, whatever is lovely, whatever is admirable—if anything is excellent or praiseworthy—think about such things.’ I think that we do have responsibility for what we sow into our lives, and into our society. I do think that we need to equip ourselves and our young people to deal with the darkness around us, but I don’t believe that the way to do this is by normalising or trivialising it to the point that it becomes unnoticed. I think that by knowing more fully the light that we have within us, and the power that it has to shine into the darkness and transform it, we can be empowered to live free from fear, regardless of what is going on around us. The challenge is to be in the world, but not of it: demonstrating hope and joy, not condemnation and despair, whatever we think about Halloween and how our neighbours celebrate it. We have previously not allowed our children, aged 7 and 6, to trick or treat but this year our eldest challenged our reasoning. He has had enough of Light parties and wants to dress up and , predominantly, collect sweets! Of his own invention he came up with the idea of “treat or treat”. We have two jolly faced pumpkins outside our house with “Light” engraved in the back and we plan to visit our neighbours dressed up as The Village People with pumpkin pie to offer them as a treat from us whilst enabling our children to knock on doors of people we know and collect the greatly desired sweets. What do you think of his idea? I have to admit I’m quite impressed ! Both posts on this topic have the same problem which have within it an absolutist and lack of appreciation for the subjective nature from which your view of Halloween comes from. Whilst, true, there is certainly a consumerist nature to the modern UK perception Halloween, it is difficult to dismiss it as a corruption of the young which feeds in to legitimising the Christian ideal of ‘good’. Think, perhaps, of the día de muertos in mexico (i recommend a research into it, it is very interesting actually), where understandings of the dead (both Catholic and maya) have fused to create a celebration of the dead which is void of the ideas which are claimed as evil, or benign. This is, in my opinion, wholly related to the lack of subjectivity with which your organizations ideology, per se, is communicating its opinions through a guise of complete objectivity. To put more crudely, if I may, your understanding of morality and what constitutes an understanding of good and evil with regard to a representation of the dead (with which Halloween and other festivals commemorate, albeit in a non-religious, mostly consumerist and culturally reflective manner), is a limited one, and differs significantly with other peoples in the world. This is particularly telling given the relationship between the día de muertos and Catholicism, for example. The initial demonising (if you could please forgive this terrible pun, I promise I am making a real point!) with which the first post “Halloween: harmless or harmful” portrays those who partake in the holiday is particularly troubling. Those who join in with “an event which glorifies the dark, creepy and scary side of life” assumes that these values are ones held by the whole of society (if not humanity) which a short look at a history, politics, or philosophy book will reveal is simply not so. Likewise, it is certainly a stretch to claim that people which dress as these spooky characters will mirror the activities with which their alter-egos are meant to partake. In this regard, an understanding of which clarifies teaching children “right and wrong” actually involves beyond simple speech acts and passage of parental and authorative knowledge is essential, with which the ability to challenge unsubstantiated forms have been surely neglected. The sentence: “The differences between the ‘traditional’ and modern Halloween are clear. The main one is that people do not believe in supernatural things in quite the same way as they once did” is of particular interest and worth mentioning given the comparison of knowledge between (which albeit incredible facetious) the disproof of ‘supernatural things’ and that of the resistance to disprove a christian god, in bringing the same amount of logic which cannot be disproven. The point being made that a belief of the christian god in one culture can be on the same par as the celebration of the dead, or death in another. Section 4: HALLOWEEN IS OFFENSIVE is of worry too, given the contrasting perceptions of death and suffering which exist on this planet of ours. With this section’s imaginary, it would seem impossible for burn victims, or other less abled peoples to participate in Halloween, but this is hardly the case. The representations of zombies, for example, has been theorised to not be an attack on disfiguration or physical abnormality, rather one of contrasting views of the metaphysical good ‘us’ versus the wholly ‘them’ with which Caribbean immigrants (noting the mythical ‘zombie’ and voodoo connection Haiti for example, represented) which migrated to the united states have been represented in modern culture. In this instance, the understanding in this example is particularly out of sync with the broadly accepted placements of the culture of horror and the abnormal in society. The modern incarnation of evil does not represent ‘evil’ in the Christian imagination, rather it represents a criticism of the tenets of ‘evil’ by demonstrating the absurdity and inexistence of evil in a setting grounded in reality. It is possible to continue in this manner processing through each of the points raised but will be on of futility if these simple recognitions are not appreciated. If challenged, however, these can and will be happily elaborated on. In this regard, it would be appreciable to recognize the lack of objectivity, or, at least, lack of sensitivity with which the previous posts have given with regard to a demonising of people celebrating the dead, devoid of the strictly Anglican political recognition of this topic. As well as the celebration of a holiday by those who do not believe in the Christian god, or christian perception of morality. Whether Halloween is ‘good’ or ‘bad’ is of irrelevance to those who believe the same tenets are decided independently and without religious insight. Bloody hell, why don’t you guys just sit back, relax and let other people live their lives? Halloween used to be related to religion, whether you like it or not. And perhaps it has nowadays lost its essence no other way but by becoming sort of a “themed fancy dress party”! That’s all!!! There are in the world loooooads of animal fancy dress parties, superhero fancy dress parties, movie fancy dress parties and also scary things fancy dress parties held on the 31 October! As a kid, I never threw myself out of a window expecting to fly after attending a superhero fancy dress party, and for the same reason I don’t think kids are very likely to get into the ocult just because they dress up as ghosts once a year! At the end of the day, it’s up to their parents to explain the differences between a fancy dress and real life -in case the kids need an explanation to that. And well, if someone is uncapable of explaining that difference, perhaps the best option is not to have kids, instead of avoiding their (and even other’s, as you are trying to do with this posts) contact with the real world with which sooner or later they will have to deal, whether their Christian protective parents like it or not.